EBU actively helps TVR ! 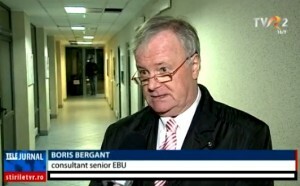 Many EBU experts have come to TVR for an evaluation program. Technical, editorial and management experts will come up with solutions to improve the overall activity of TVR, which was on the verge of being expelled from EBU, beacuse of debts of aprox 17 million euros. We expected this kind of news ever since Irina Radu from TVR announced that an agreement has been reached, and that TVR will be able to participate and actually applied for Eurovision 2017. Here si what a few of the EBU officials had to say…. A few months ago, TVR lost the right to broadcast the European Football Championship and almost got excluded from the EBU. The relations got improved after the Romanian government payed more that 6 million euros, as a first downpayment of the historic debt. As a result of the negociations, TVR agreed to pay the rest of the more than 10 million debt in max. 3 years. In this way TVR will be able to transmit the 2017 Eurovision Song Contest, and also the World Football Championships from 2018 and 2020.